Ok now it is time to start on the hedges and fields. Before we start though we have to create a new sheet called HEDGES. 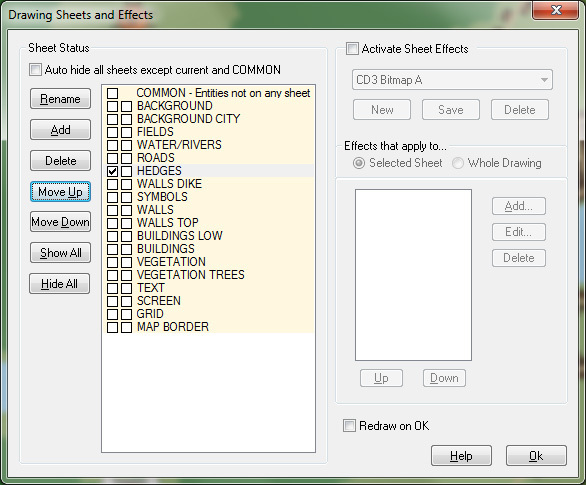 Click on the “Sheet and Effects” icon on the left side of the CC3 program. 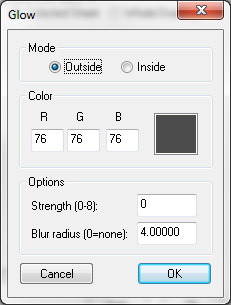 In the window that opens (see image below) you click “Add” on the left side to get a new sheet. Name the new sheet HEDGES and click on the “Move Up” button to move it just below the ROADS sheet. You now have a sheet for your hedges but you also need to add some effects to make them look good. 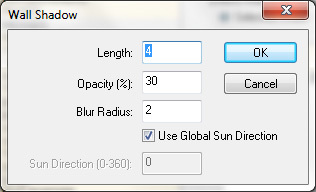 Select the “City Hedge tool” from the “Select drawing tool” menu. I find the smallest hedge to be a bit too large so I made a new one that is only 2′ wide.To do this just open “Select drawing tool”, select Advance and chose “City Hedge 3′”. 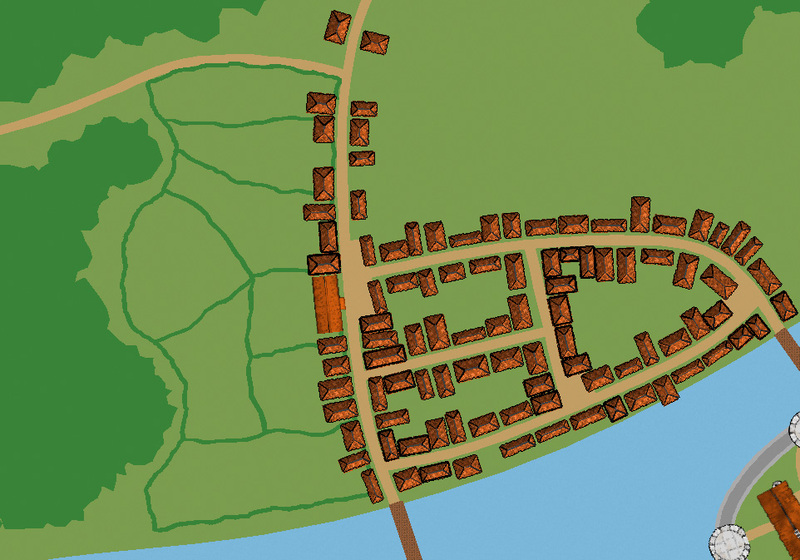 Select properties and change Width Fixed to 2, click OK and save as “City Hedge 2′”. Now it is time to start drawing the hedges. I usually follow the roads and try to make an area that is surrounded by hedges, like in the picture below. I then start to divide the area into smaller pieces.In this way I create a nice pattern that looks like fields, see below. I continue this way until I have covered all the areas where I want to have my fields. The end result will look like something in the picture below. So far all the fields are green, but we also want to have some yellow ones (or some in another colour if you prefer). To do this I select the “fields tool” from the “Select Drawing Tools” menu. 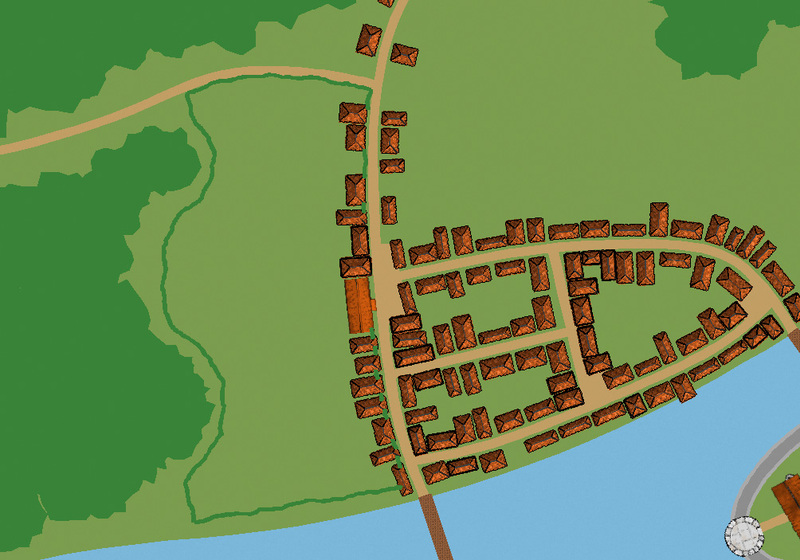 I then paint the whole map in the colour of the “Fields tool”. This will turn all the green grass areas yellow. Now open the “Sheet and effects” window and hide the FIELDS sheet. You hide a sheet by clicking on the white square just next to the sheets name. This will bring up a small H inside the square, which means that the sheet will be hidden. Click OK and the map will look just as before you started to draw the yellow fields (because the FIELDS sheet is now hidden). The reason we’re doing this is that we are going to export one map with the FIELDS sheet hidden and one when it is visible. We will then combine the two maps in Photoshop, but that will be for a later post. First we have to do some last finishing touches in CD3. But that has to wait until the next post. 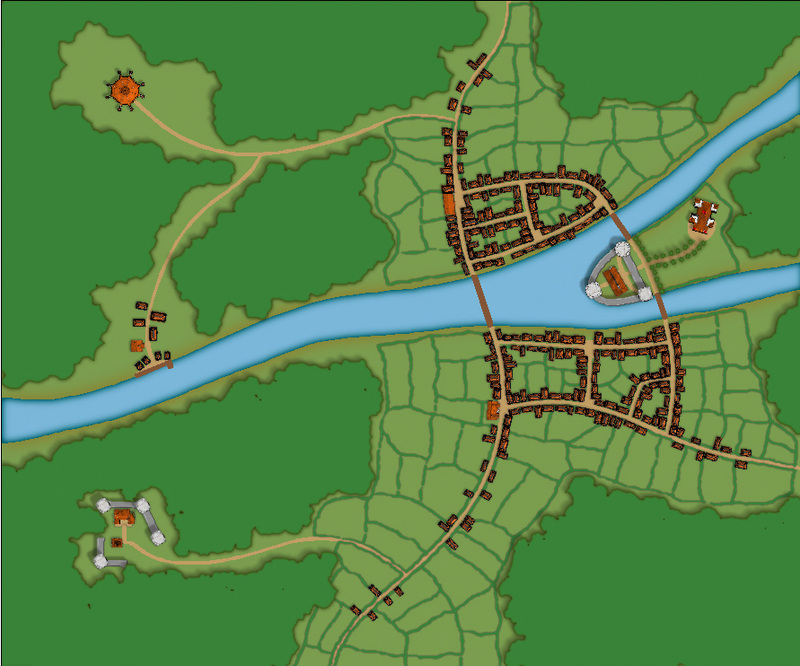 This entry was posted in Maps and tagged CC3, CD3, Town, Tutorial by clercon. Bookmark the permalink.